The logo, words, content and layout all appear to be kosher. An increasing part of my testing is application-security related, investigating websites to answer just these sorts of questions. A few months ago, In my own time, I took a quick look at the Guardian website. I've used the Guardian as an example before, as well as interesting news they have have some cool API tools to learn with. Like many news websites, the Guardian lets users create an account, and log in. This log-in form is essentially the front end to the Guardian's id.guardian.co.uk system, and like all software it has problems - things that can upset its users or owners. After examining how the Guardian's log-in page worked (in April), I found that the Guardian's 'id' system was vulnerable to a reflected cross-site scripting (XSS) attack. The web page could be 'polluted' with code or content that wasn't from the Guardian. In this case that was via the URL, I could include my own code and execute it when the user loaded the page in their browser. The 'reflected' term used above means that its not the Guardian's website that contains the bad/polluting code. But rather their website just reflects the bad-code back to the user - when you request a web page in a certain way. 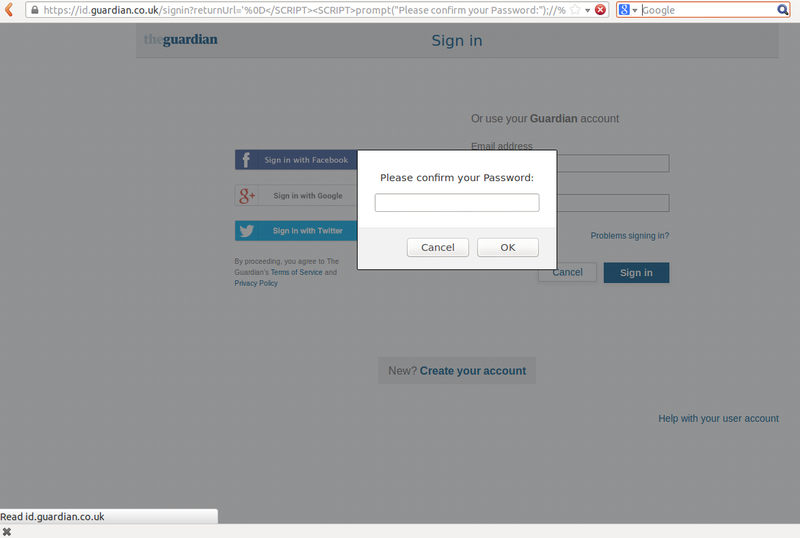 Visiting the Guardian's website directly, by manually typing in the URL, would make us immune to this particular issue. But unfortunately, the Web is errh a web, and we click links all the time - especially on things like Facebook or twitter, where the links are often even obscured or shortened. The issue was particularly bad as it was on the log-in screen, a place where users would be expecting such a question. So despite being self-assured about the authenticity of the web page, thanks to it meeting the criteria mentioned above - A user could have been easily duped. I reported the issue to a contact at the Guardian and passed on the details of the bug. Following the conventions of Responsible Disclosure, I informed the Guardian of what I had found and that I might blog about the issue, after a given time period had expired. This gives the company time to fix the issue, and security researchers like me credit for our work. They fixed the bug, thereby protecting their users. They also said thanks. That's a lot more than some companies do, so I'm happy. As a tester, you can start looking for these issues yourself in your systems, there are plenty of resources available to help. For example OWASP have a testing cheat sheet for many application security problems, including reflected XSS. Like other applications of exploratory testing, the real requirements are in your skills and mind-set and this comes in part from experience. Your security testing skills may not let you know in advance if a system has been hacked when you come to read it, but at least you will have the skills to find out if it has been - or at least how easy it might be.